A variety of literature describes how individuals make the transition from student to professional educator. Most teacher educators expect the transition to be a rather lengthy process incorporating several years of training and practice. One theory suggests a five-step process for the development of expertise in any area (Trotter, 1986). These stages are: 1) Novice, 2) Advanced Beginner, 3) Competence, 4) Proficient, and 5) Expert. It generally takes 10 to 15 years to move from novice to expert. It just takes that much time and experience to accumulate the necessary knowledge and skills. As a candidate moves through the undergraduate program, he or she will generally move through the first two levels and start work on the third. It generally takes several years of experience to become fully developed in the competence stage. Finally, only a very few teachers, even those with decades of experience ever move into the proficient and expertise levels. The following narrative provides an overview of the knowledge and skills developed at each level. The first stage of attaining mastery is the novice stage. At this point the individual's task is to learn to recognize specific objective facts along with fundamental concepts and specific rules of action. Prospective teachers are supposed to get an overview about what it is to be a professional educator. They begin developing some initial skills, acquiring an initial vocabulary, and obtaining some initial ideas about what teaching is all about. Their initial understandings are still incomplete at the end of this stage. It is not intended that they will have a clear vision of the profession by the end of this stage and are not supposed to have the complex skills to take charge of the classroom by that time. However, it is expected that students will begin to develop a cognitive map or one piece of a cognitive map about what it means to be a professional educators. The second stage in the process is the advanced beginner stage. At the advanced beginner stage preservice teachers are adding to their knowledge of facts, they are recognizing previously undefined facts, obtaining more information relative to the teaching-learning process, increasing their knowledge of relevant vocabulary, concepts, and principles. As they go into the advanced beginner stage, they begin to understand that what they have been taught to that point is a good first approximation of a very complex set of understandings necessary to function as a professional educator. This stage continues your development in your undergraduate program and involves 300- and 400-level courses in your major. Your undergraduate training ends with a student teaching experience. However, moving through the advanced beginner stage requires more than simply completing college courses. In order to successfully move into the next stage, that of competence, a considerable amount of classroom experience is required. That is, one does not normally become a competent professional without a significant amount of hands-on teaching-learning experiences. One does not become a professional educator by taking college classes alone; there must be engagement in the teaching-learning process. For this reason VSU teacher education programs provide students with a variety of field experiences throughout the training period. This is a critical component of becoming a professional educator. The third stage is competence, the point at which an individual is capable becomes qualified in their desired area. For teachers, this generally means completing a Bachelor's degree in education and meeting initial certification requirements. Competence is really the minimum that level that individuals should obtain in order to act as a professional educator. At this stage the individual is beginning to recognize more context-free principles and concepts as well as situational elements. In other words, the teacher has some understanding of concepts and principles that hold for most learners in a variety of situations and other principles and concepts that apply only in specific situations. Towards the latter part of this stage, the individual begins to acquire the ability to problem solve. That is, the individual begins to say "I tried this, but the results are not what I wanted. What do I do now?" This is very different from the procedure-following approach that might be expected from someone in the advanced beginner stage. This stage begins as you accept full-time employment as a professional educator. It generally takes 2-5 years of one-the-job training (and, in my opinion, a master's degree) for a person to become a competent professional educator. Many teachers never achieve this level because they don't gain enough experience. 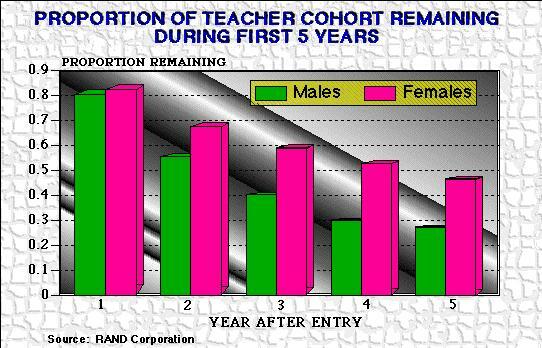 The figure below shows that 50% of women and 70% of men leave the profession before they gain five years of experience. More recent data suggest that retention is better for individuals who complete a master's degree and worse for individuals who complete an alternative certification program. Source: L. Darling-Hammond (2000). Solving the dilemmas of teacher supply, quality, and demand. NY: National Commission on Teaching and America’s Future (NCTAF). More specifically, the types of preservice coursework and learning experiences lead to reductions in teacher attrition after the first year of teaching. The next two stages in the development of mastery are proficiency and expertise. These individuals are generally recognized as being among the best in their chosen fields. Only a small percentage of professional educators ever reach this stage. These are the teachers one normally thinks about when we remember the teachers who had the most influence on us. In the stage of proficiency an individual can identify the important elements of the task very quickly, very easily. They have a fluid style that allows them to implement decisions based on intuitive understandings--understandings that come out of their experiences. These understandings are so internalized that sometimes they can not even state why it is that they are thinking that way. This is the stage that an individual's style begins to be expressed and the person's experience (rather than school training) begins to be a major factor in performance. Most people at this stage have acquired a mentor who can guide them beyond the general education available through coursework. At the expertise level--and these are really the stars of the field--the individual is operating in an experienced-based similar to that achieved at the proficient stage, but in a more holistic manner. This means that they are not focusing on simply one or two elements, but are able to comprehend and work with a variety of patterns. For most individuals in a field, those operating in the stage of competence, if they try to focus on more than one or two variables at a time, they get cognitive overload and cannot handle it. People who are operating at the stage of expertise can handle a large quantity of information and give a very fluid, natural performance. The major difference between individuals in the stages of proficient and expertise is that what individuals in the latter stage do almost always works. Individuals in the stage of proficient still make mistakes; those in expertise provide almost perfect performance. We feel very fortunate when we have the privelage of engaging one of these teachers. We may only interact with a handful in our entire education experience. These educators are widely recognized as superior. They are also likely to be mentors for educators who desire to become like them. Trotter, R. (1986). The mystery of mastery. Psychology Today, 20(7), 32-38.